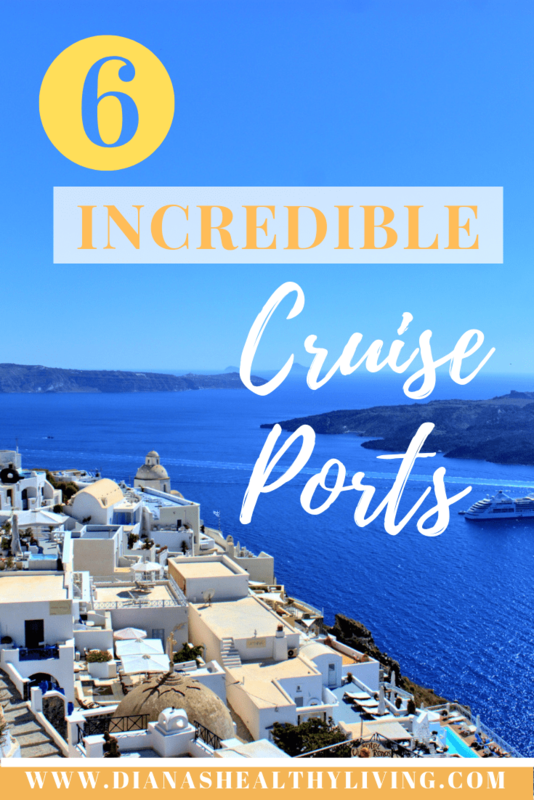 Staying on each Greek Island for multiple days would be fantastic, but when you’re short on time, the best way to travel the Greek Islands is via a cruise. The 7 day Norwegian cruise from Venice has some of the popular Greek Island stops and is one of the best Greek Island cruises. This was a great way to see the Greek Islands in October. 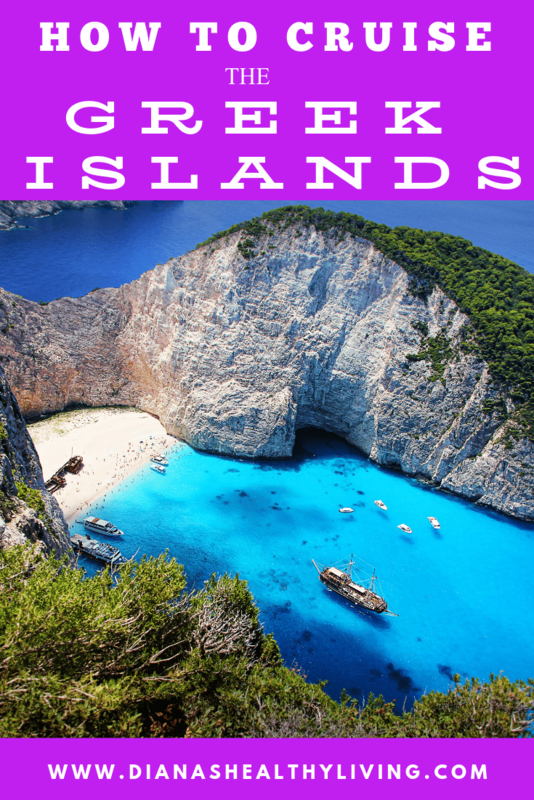 The Greek Islands are divided into six main island groups namely the Saronic Gulf Islands, the Cyclades Islands, the North Aegean Islands, the Dodecanese Islands, the Sporades Islands, the Ionian Islands, plus the island of Crete. It’s not too difficult getting around the Greek Islands within a group as this can be done via ferry and hydrofoil options. 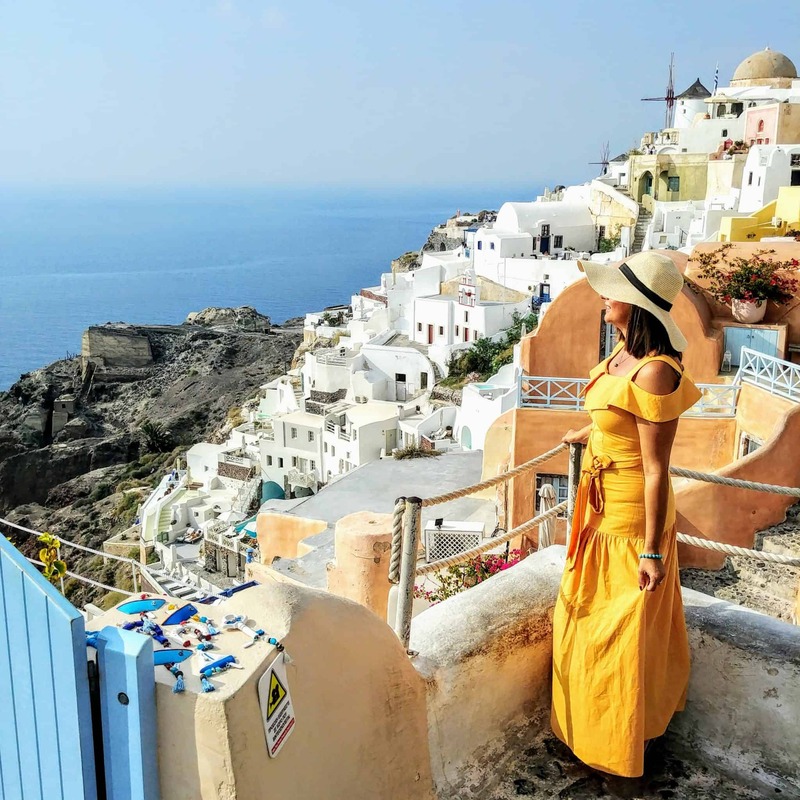 However, if you’re considering how to travel the Greek Islands in different groups, the only option really is to cruise around the Greek Islands or to fly. 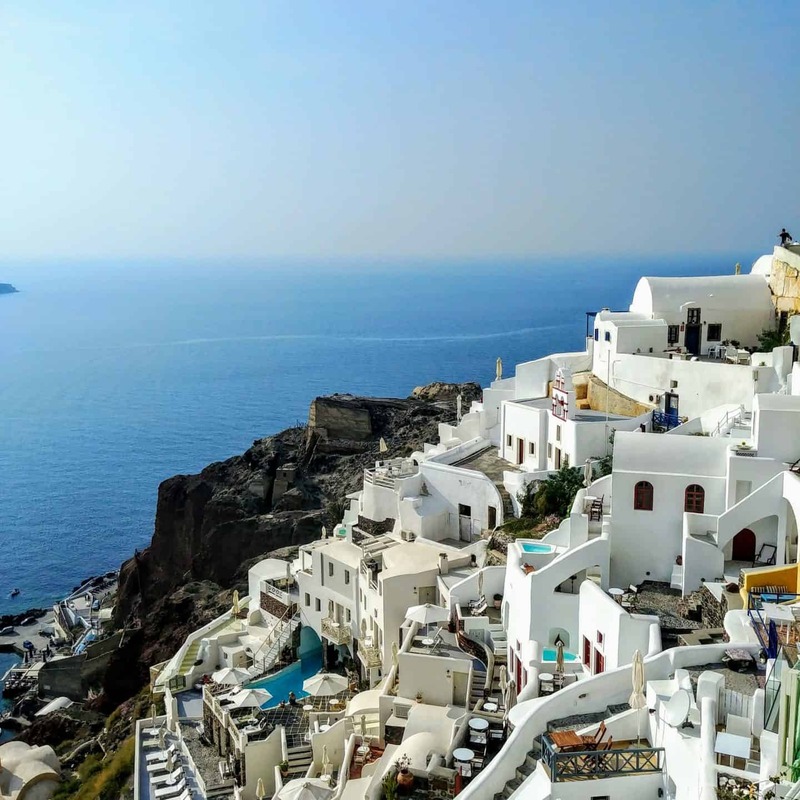 Which is why Greek Island cruises are such a great option, as there is no need to check into multiple hotels and unpack multiple times. We recently took the Norwegian Cruise from Venice which is a fantastic 7-day Greek Island cruise, which includes 6 port stops. 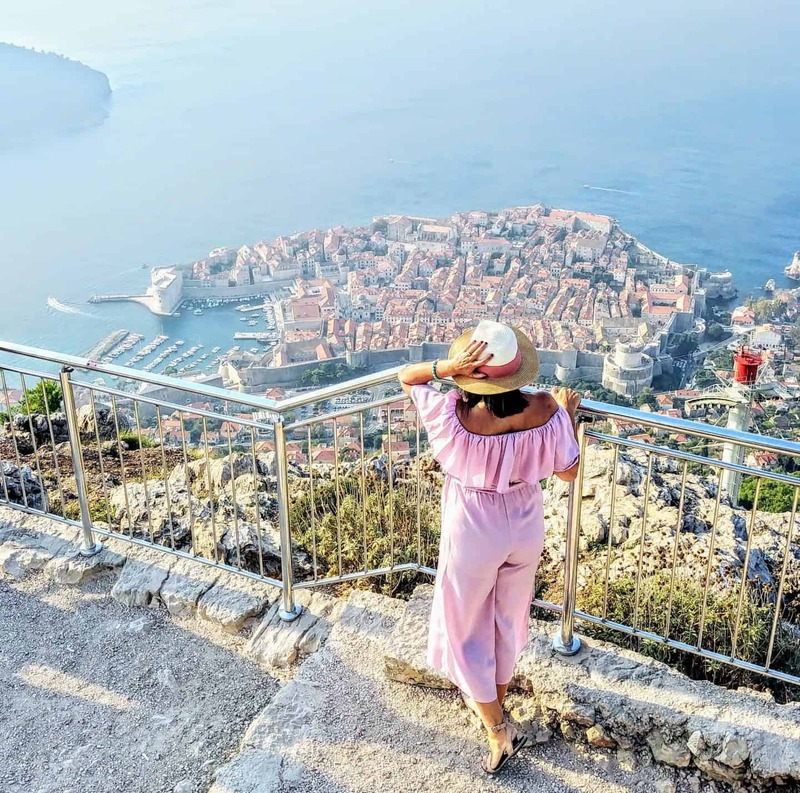 The cruise from Venice to Greek Islands includes stops at Mykonos, Corfu, Santorini, as well as a stop in the Montenegro city of Kotor, the Croatian city of Dubrovnik and back to Venice. 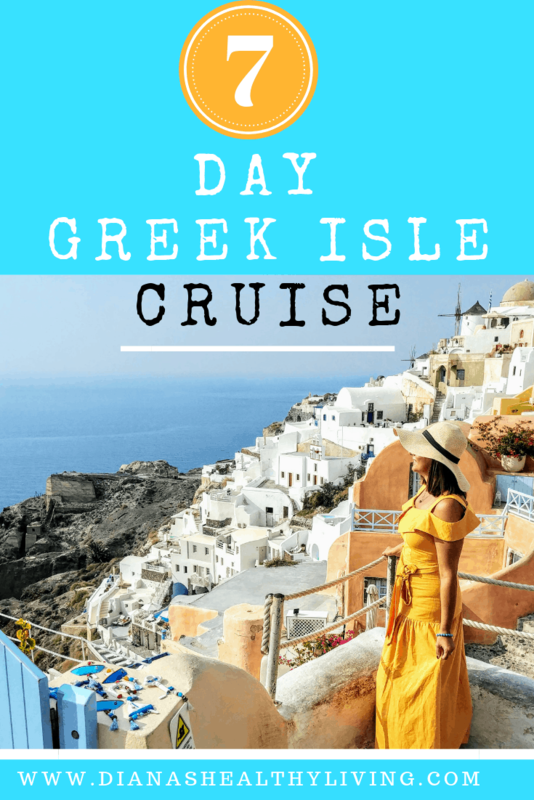 We had a fantastic time and highly recommend it if you are looking at 7-day Greek Island cruises, as it really is the best way to see Greek Islands in one week. 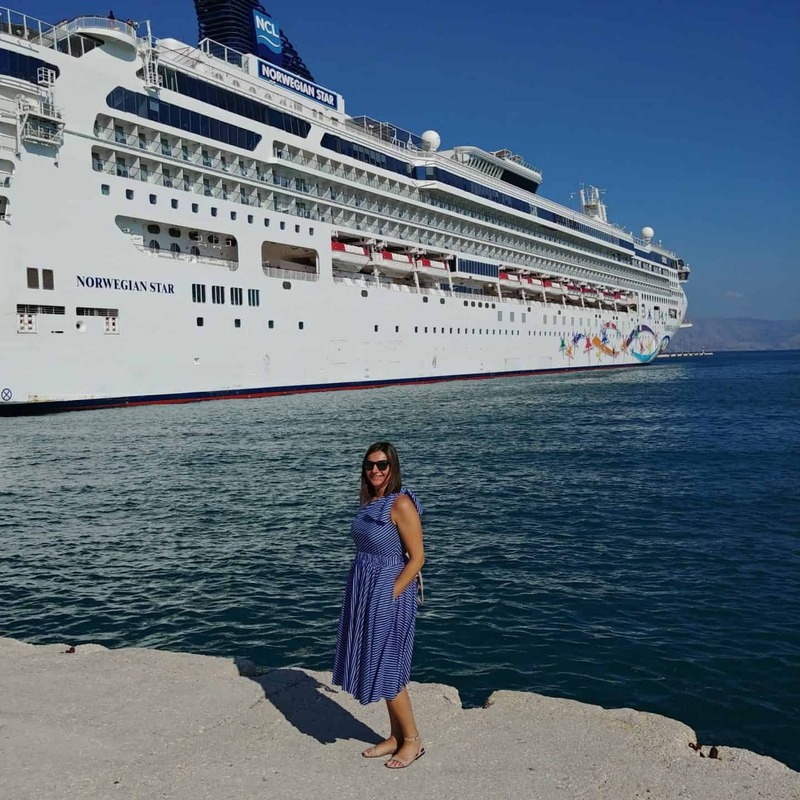 If you’re interested in learning more about this Norwegian Cruise – Greek Islands, then keep reading below for my full Greek Islands cruise review. As mentioned the best way to travel Greek Islands for 7 days really is onboard a Greek Island cruise. 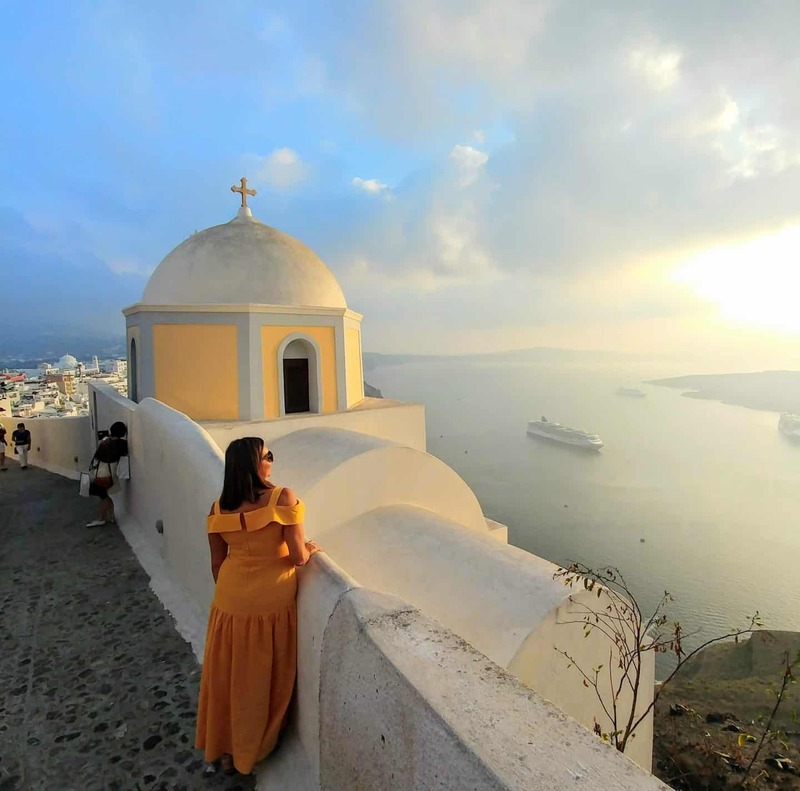 While you don’t spend too long on any given island, during this 7-night Greek Isles cruise onboard the Norwegian Star you will get a great overview of the islands. 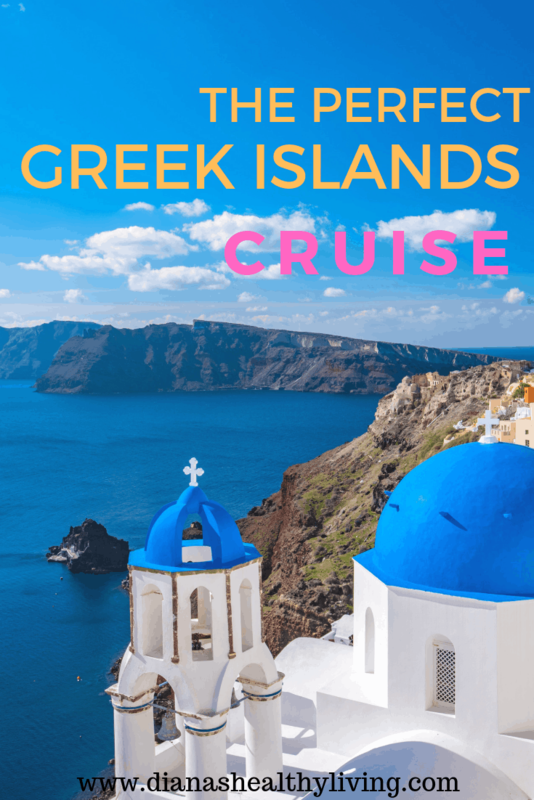 Let’s check out the Norwegian Cruise Line Greek Islands itinerary. We arrived in Venice the day before our cruise so we didn’t have to feel rushed. 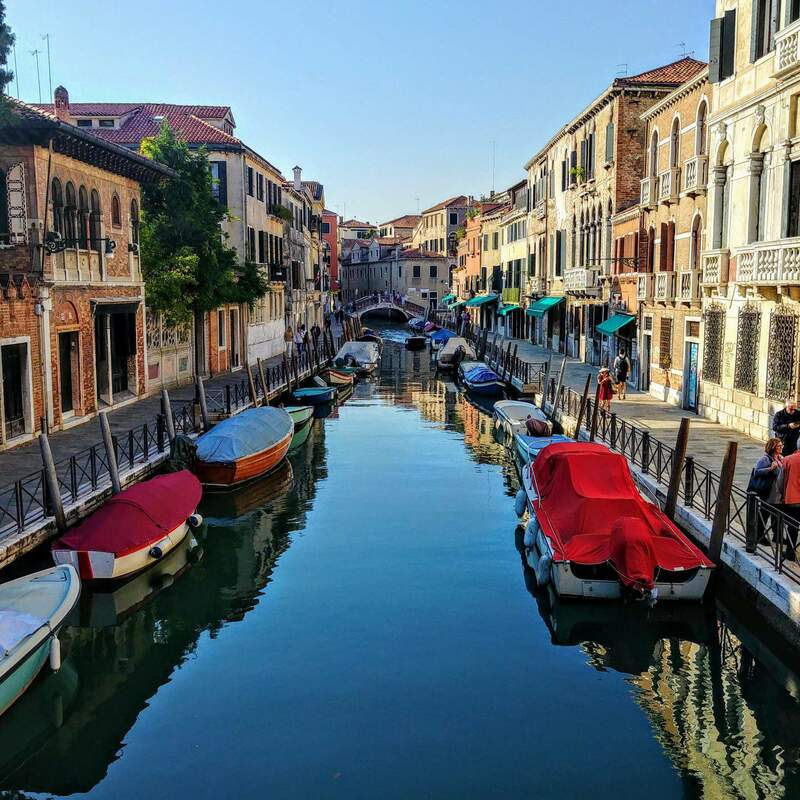 We took full advantage of our short stay in Venice and started to explore the city as soon as we checked into our hotel and dropped off our bags we were off to get lost in the Venice street. The Venice to Greece cruise departs Venice at 5pm. However, you are required to be on board the Norwegian Cruise Line – Greek Isles, no later than 3pm. Getting to the cruise port from Venice was fairly easy and inexpensive. We walked from our hotel to the People Mover that took us directly to the port which was only a short ride. Once we arrived at the port we walked to where the Norwegian Star ship was docked for check-in. The check-in process is fairly easy as it is the same as checking in for a flight. Once you arrive at the port your luggage is tagged and checked in and will be delivered to your cabin by the afternoon. You then proceed to the check-in counter where you get your cabin fee. Your picture will be taken for your room key and credit card swiped for any incidentals. Once you have received your cabin key you will then proceed to security (like at the airport) where your bags are scanned. Most of the first full day of the cruise from Venice to Greece is spent on the water. We took full advantage of the late port stop and explored the ship. As we were getting closer to Kotor, we took in all the beauty of the mountains. At 2pm we arrived at our first port being Kotor in Montenegro. Kotor is located between the mountains and the Bay of Kotor on the Adriatic Sea and is listed as a UNESCO World Natural and Historical Heritage Site. Despite only having 6 hours in port (departure is at 8pm), you get the opportunity to stroll the cobbled streets, admire the old buildings and explore the gorgeous little cafes and shops. Kayaking the Adriatic Coastline: Over 3.25 hours explore the waters of the Bay of Kotor by kayak. 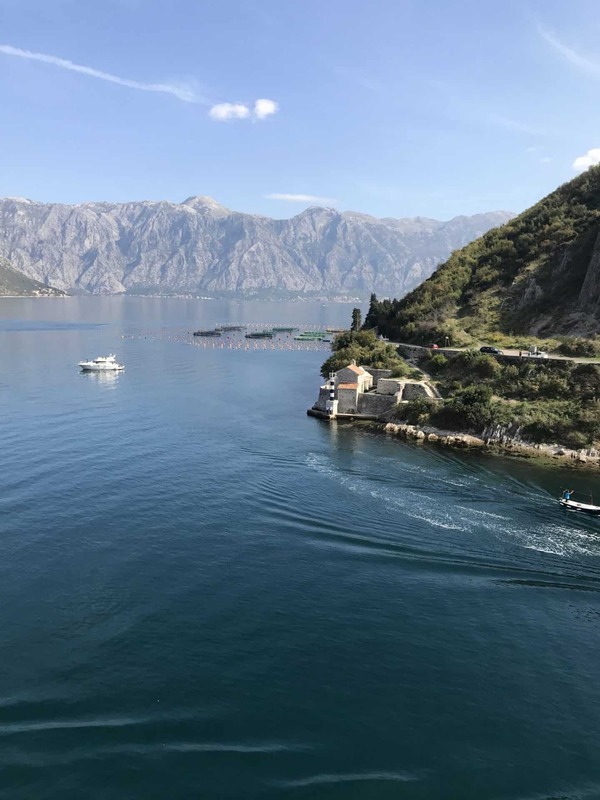 In Kotor, we did the Budva and Kotor Montenegrin Pearl tour. Once we arrived at the port we met our guide at the port of Kotor. 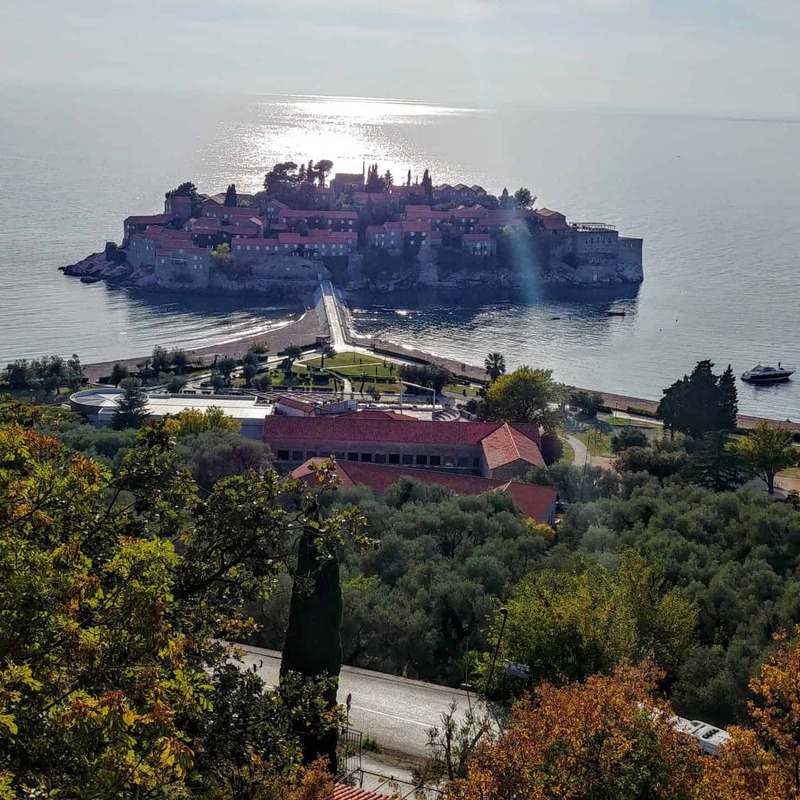 Before driving to the town of Budva we drove to view Sveti Stefan, once a 15th-century fortified town on an island. Today it is an exclusive resort. After our photo stop we headed to old Budva. We did a walking tour of old Budva. We walked through the narrow streets of this fortified medieval town which was influenced by the ancient republic of Venice. After our tour of Budva, we returned to Kotor to stroll through the UNESCO World Heritage site of Kotor. On day 2 of the Greek Isles cruise, the ship docks in Corfu at 10 am. Corfu is said to be one of the lushest of the Greek Islands and is absolutely stunning with its dramatic blue waters and sweet little hillside villages. With a full day of exploring, (the ship departs at 4pm) you have plenty of time to explore the island. Discover the best of Corfu on this tour. You’ll tour the island, visit a stunning palace and enjoy a traditional lunch with live entertainment at a local taverna. Drive through Corfu and arrive at Achilleon’s Palace built by order of Empress Elizabeth of Austria and completed in 1891. 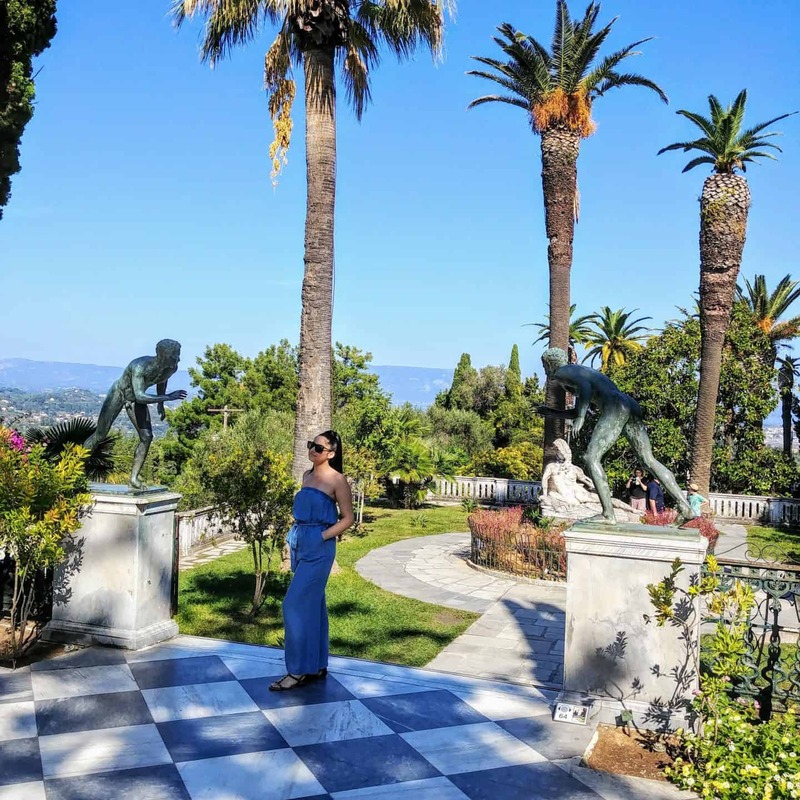 The empress had fallen in love with the natural beauty of the island during her 1861 visit and also developed a great appreciation for Greek history and mythology. After a guided visit of the grounds and palace, you’ll continue to the traditional village of Kinopiastes. Enjoy a rich and traditional lunch at the famous Tripas Tavern accompanied by live Greek music and dancers. Board your coach for the drive back to the Old Town of Corfu where you’ll have the opportunity to either be dropped off, to walk through the narrow lanes and browse on your own, or return with the coach directly to your ship. Day 3 of this cruise Greek Islands tour is a long day of cruising so a great opportunity to join in some of the onboard activities. We enjoyed the Charming Oia Village tour that took us to both Oia and Fira where we took the cable car back down to our ship. At 2 pm the ship docked into Santorini. One of the more popular Greek Islands, Santorini is a stop on all the best cruise Greek Islands tours. The island is well known for its whitewashed villages hanging on the edge of the cliffs. With the ship departing at 10pm, you have 8 full hours to explore the gorgeous island and discover volcanic Santorini. Built high up on the ridge of red rocks, Oia offers breathtaking views of the blue Aegean and the caldera below. Take a stroll around the narrow streets with free time to visit the art galleries, antique shops and perhaps enjoy a cup of coffee in one of the cafés or pastry shops. Many artists have fallen in love with this idyllic setting and their presence is obvious in the many art galleries. This traditional village offers you spectacular photo opportunities of the famed blue domed churches and sundrenched verandas. On day 4, you’ll arrive nice and early at the Mykonos cruise port. 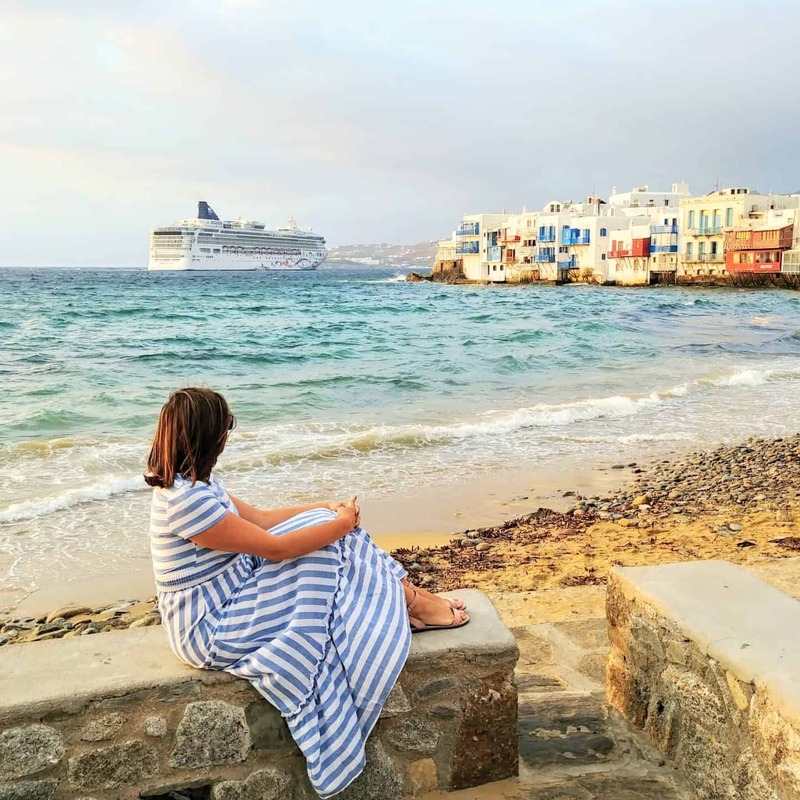 Mykonos is a popular stop for cruises around the Greek Islands given it is a classic Greek island with whitewashed houses, blue-domed churches, windmills, and stunning Greek beaches. Arriving at 8 am and departing at 3 pm, you’ll have almost a full day to explore Mykonos. If you are lucky enough to spend some extra time in Mykonos, make sure to check out some of the best places to stay in Mykonos. In Mykonos, we did the Scenic Views of Mykonos tour that took us to an Ouzo factory. Ouzo is a dry anise-flavored aperitif that is widely consumed in Greece and is Its taste is similar to other anise liquors. We also got to explore some of the local beaches, white houses and churches and the world famous windmills. 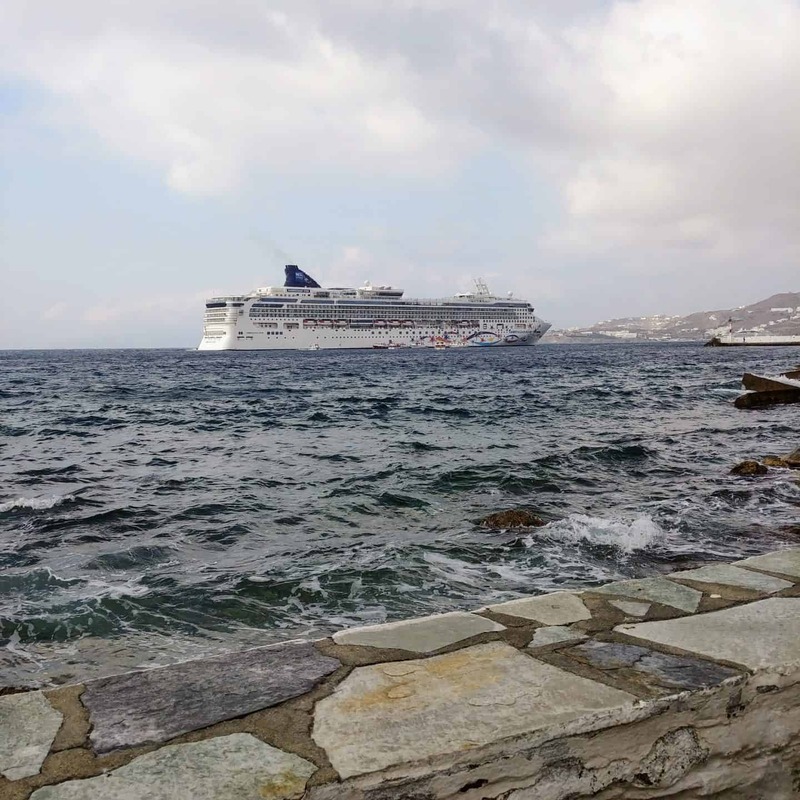 After our tour we had some time to explore Mykonos and walked around the famous shopping streets, little Venice and of course enjoyed some delicious Greek food. One dessert that I would highly recommend is orange pie. Orange pie is a staple in every Greek household during the spring and summer season and I would highly recommend that you fill your belly with this delicious dessert. Sea days are meant for sleeping in, eating and enjoying the cruise ship. 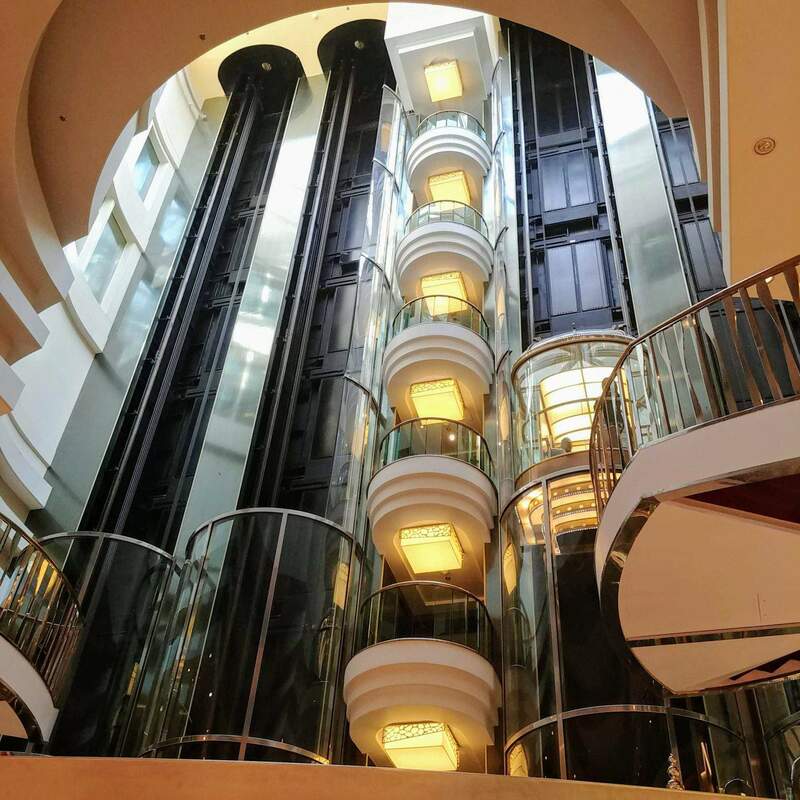 We slept in and found ourselves lazily roaming around the ship from restaurant to restaurant. 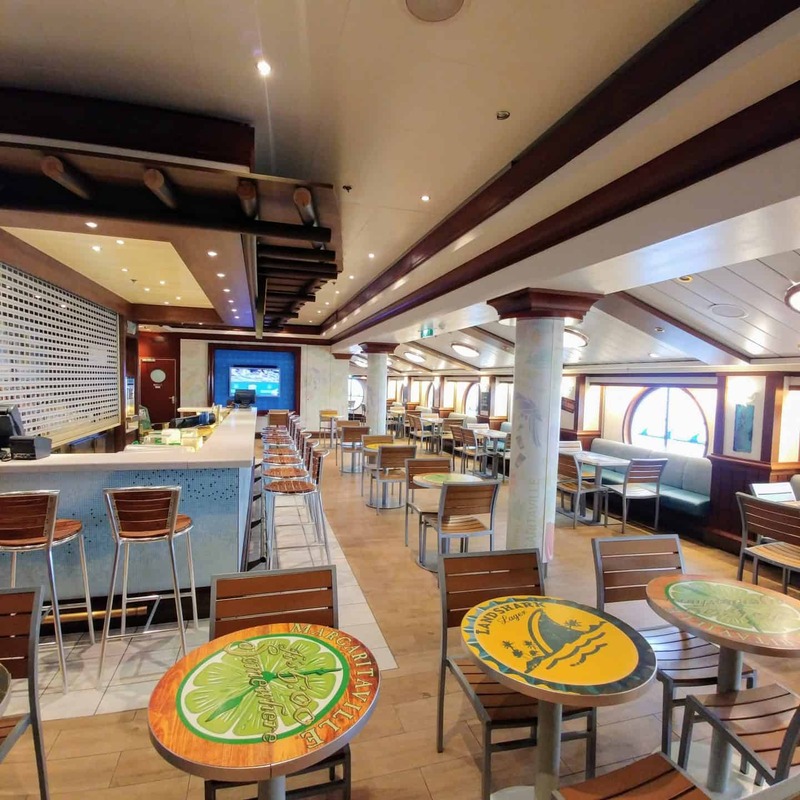 There is no shortage of food on the cruise ship and you will want to try every one of the restaurants on board. We lounged by the pool and walked a few laps around the jogging track to help burn off those extra desserts. 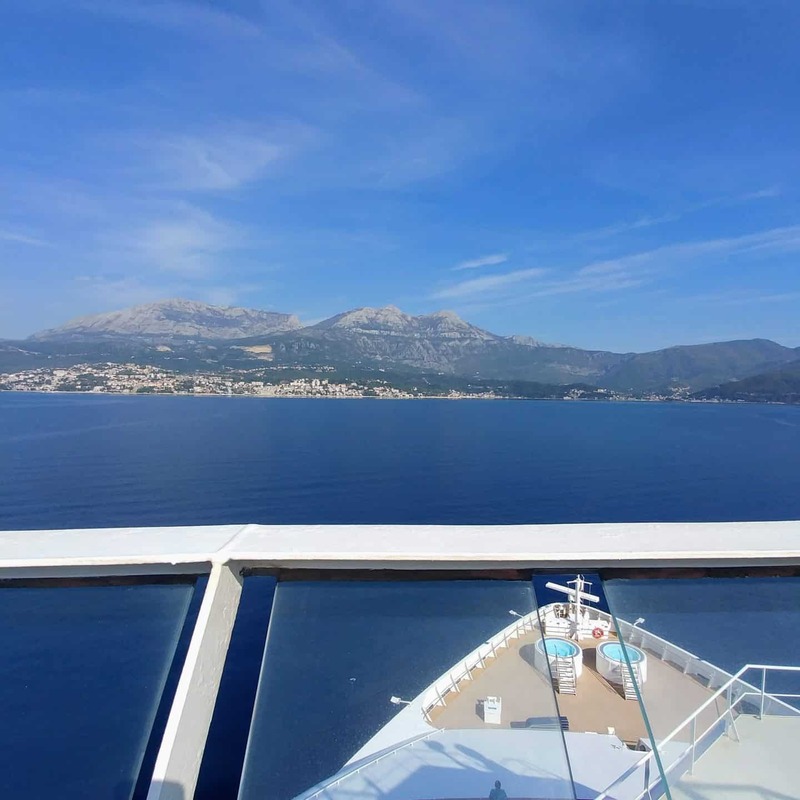 After exploring the Greek Islands, this cruise from Venice to Croatia will arrive bright and early at the Dubrovnik cruise port. Named “the pearl of the Adriatic” by the poet, Lord Byron, you’ll love exploring this city’s gorgeous streets, admiring the old buildings with bright orange roofs and the lovely beaches. Arriving at 7.30 am and departing at 1.30 pm, you’ll have around half the day for exploring. In Dubrovnik, we enjoyed our own Dubrovnik walking tour in this dreamy town. We walked around the walls of Dubrovnik then we took the cable car to get some amazing panoramic views of Dubrovnik. I would highly recommend this. We had enjoyed some Croatian pizza (I think it’s better than Italian pizza but don’t tell my husband I said that) and you can’t visit Dubrovnik without having palacinke – it is the Croatian version of a crepe. All cruises from Venice to Greek Islands must, unfortunately, come to an end, and this best Greek Isles cruise ends on day 7, arriving in Venice at 8 am. You will certainly be comfortable during this Venice to Greek Islands cruise. Like most cruise ships, the Norwegian Star is huge! 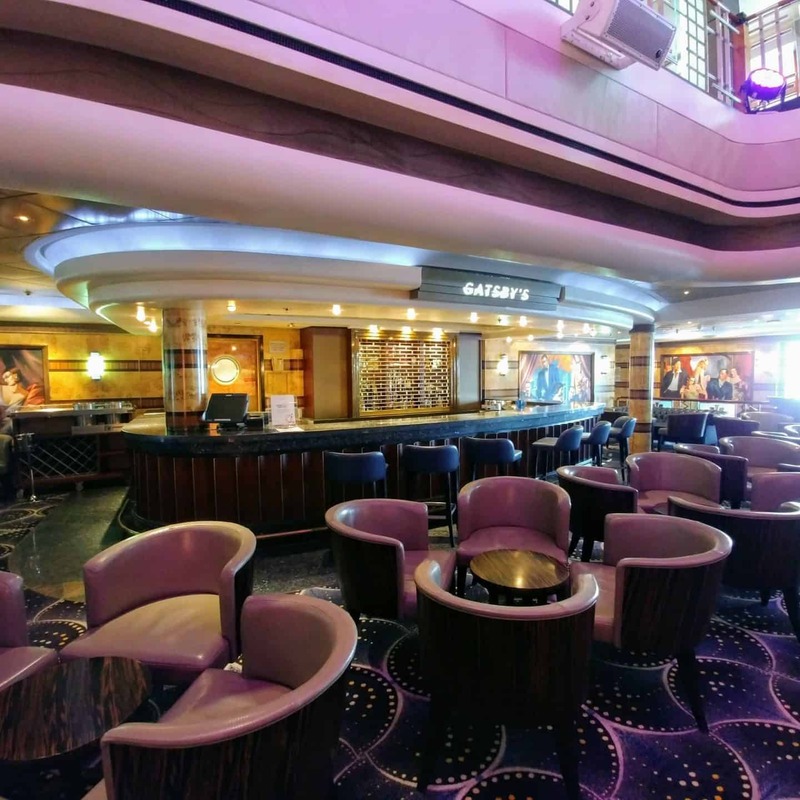 With 14 decks, the Norwegian Star has 15 restaurants and cafes, 10 bars and lounges, a casino, a theatre, heaps of recreation areas and a dedicated area for the kids. 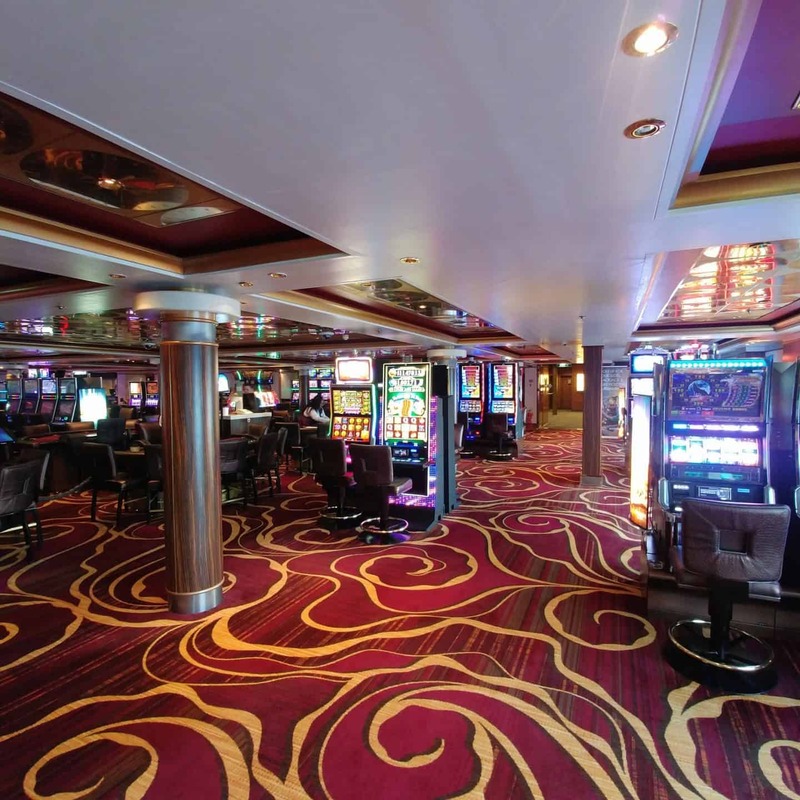 The Norwegian Star has been recently refurbished as part of The Norwegian Edge program. Onboard this Greek Island-hopping cruise, there are a variety of room options suitable for 2 people, 3 people, and 4 people. Rooms are further split into categories namely inside, ocean view, balcony, mini-suite, and suites. These are the budget rooms onboard the cruise to Greek Islands and include everything you need including TV, sitting room and more. These rooms are found on decks 4, 5, 8, 9,10,11 and 12 and are around 142sqf in size. 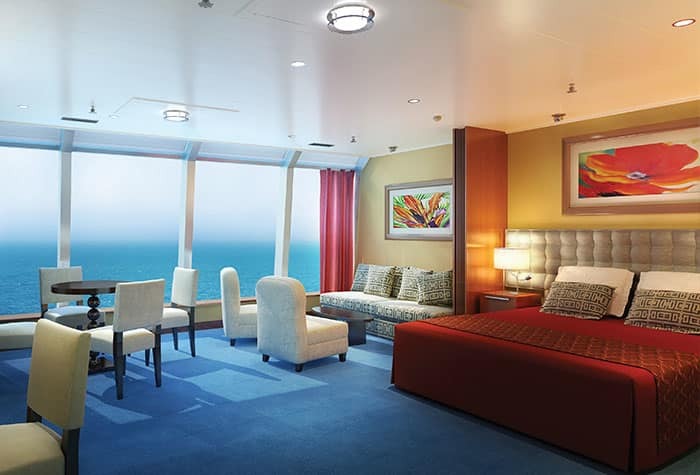 If whilst on board your cruise of Greek Islands you’d like to see the ocean out your window, these rooms are for you. Suitable for 4 people, these rooms are spacious at around 159 sqf and are located on decks 4, 5,6 and 8. For those wanting a little more luxury on their cruise through Greek Islands, the rooms with balcony’s are perfect. These rooms accommodate 3 people and have floor to ceiling glass doors opening to your very own balcony. 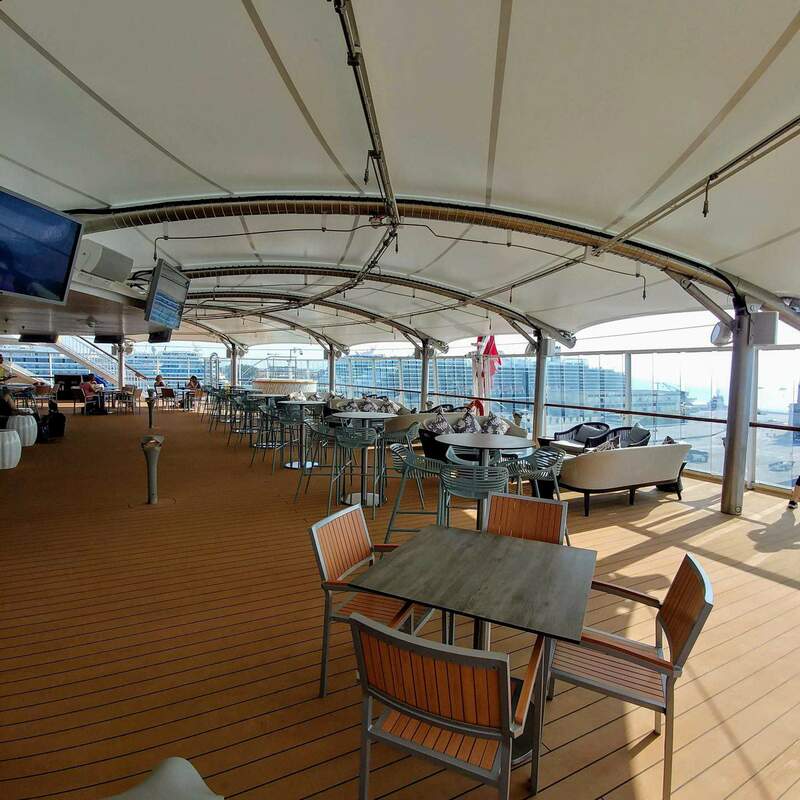 These rooms are found on decks 8, 9, 10 and 11 and are very spacious from 203 to 303 sqf. During your Greek isle cruise, the mini-suites provide additional space with your very own sitting room as well as a luxury bath and shower and your very own balcony. These rooms are suitable for 4 people and are spacious with 283 sq feet of space. Mini-suites are located on deck 11 only. For the ultimate in luxury Greek Island cruises, there are a variety of different suites available accommodation from 4 to up to 7 people. Choose from luxury 1 bedroom, 2 bedroom or even 3-bedroom suites with your own deck, hot tub, even butler and concierge service. Suites are located on decks 8, 9, 10, 11, 12, 14. One thing is for sure – you won’t go hungry on board the Norwegian Cruise – Greek Islands. With many restaurants and bars to choose from you will never get bored or eat the same thing again. Cruising the Greek Islands whilst eating Irish pub classics is possible onboard the Norwegian Cruise Line – Greek Islands. This bar and grill is open 24 hours and there is no additional charge. 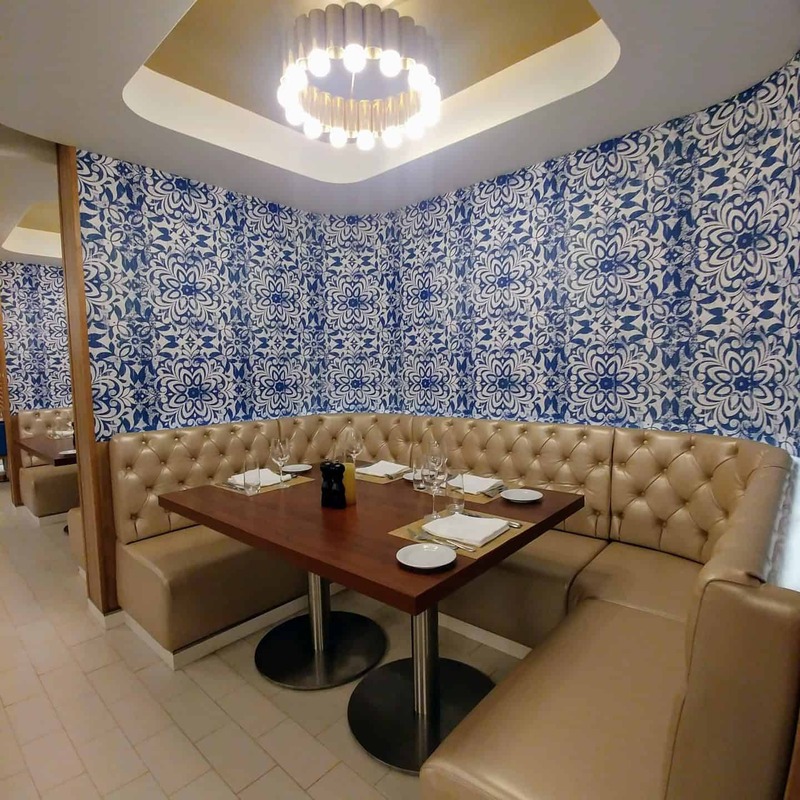 Cruise the Greek Isles while enjoying authentic Brazilian food at Modern Churrascaria. Enjoy salads and skewers of slow-roasted meats. At this steakhouse enjoy American style food. 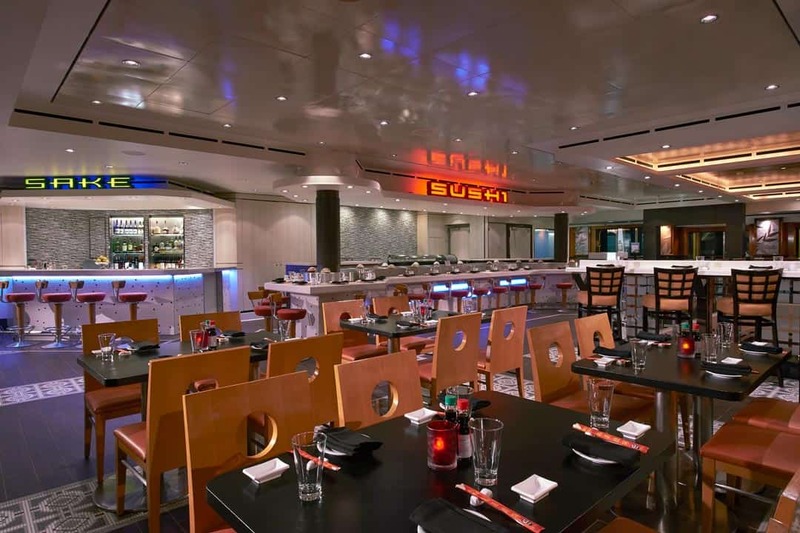 Onboard the Norwegian Cruise Line from Venice you can enjoy a buffet breakfast, lunch, and dinner at the Garden Café. 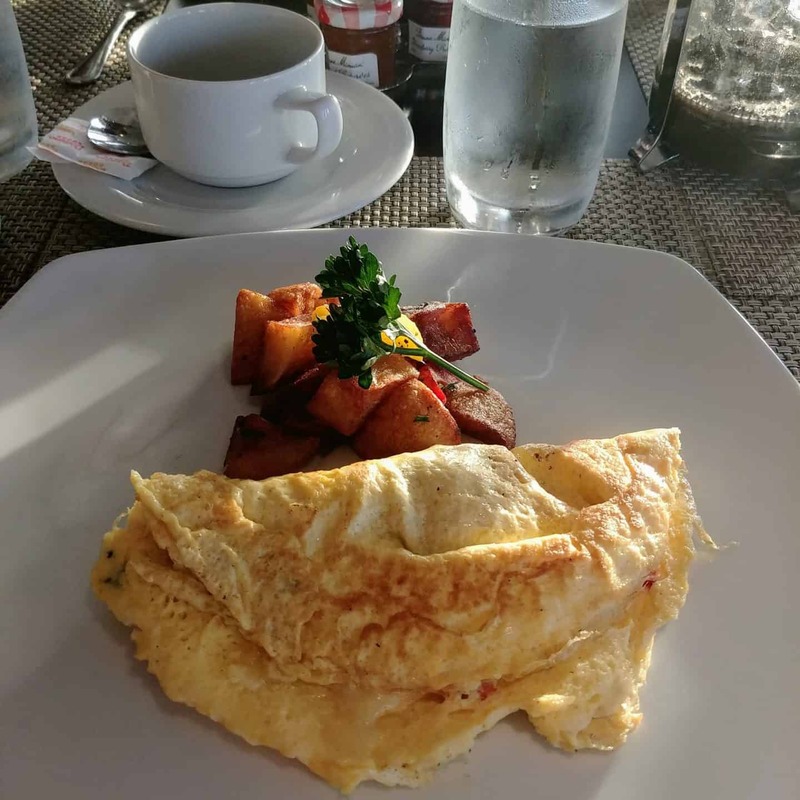 From this café there are gorgeous views across the ocean and plenty of food options including meats, pasts, omelets, waffles, ice cream and more. 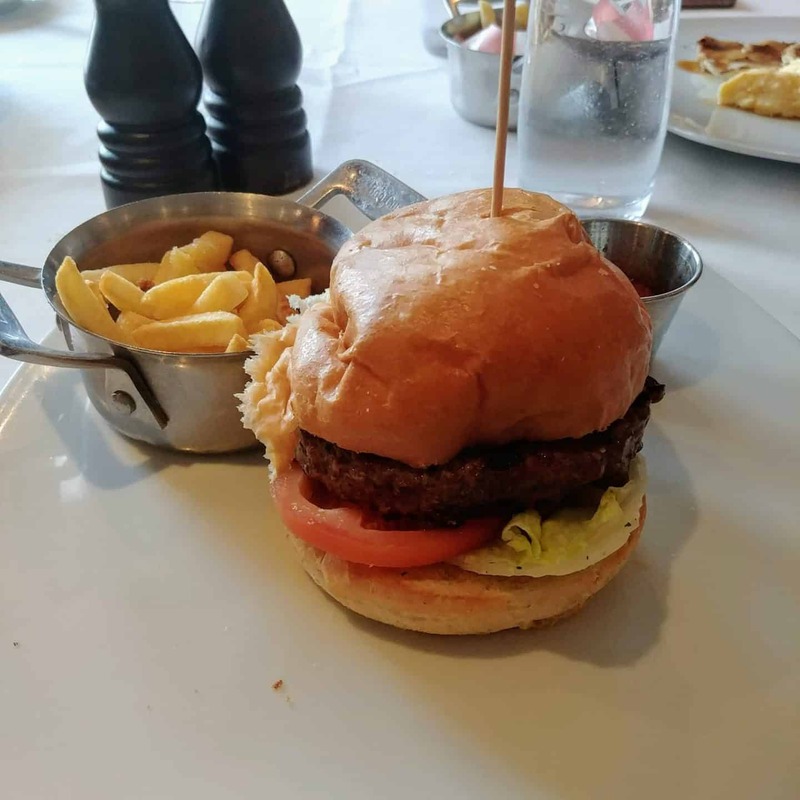 While onboard this Venice to Greek Islands cruise, if you crave some casual dining and good such as burgers and hot dogs, then Topsiders is perfect for you. 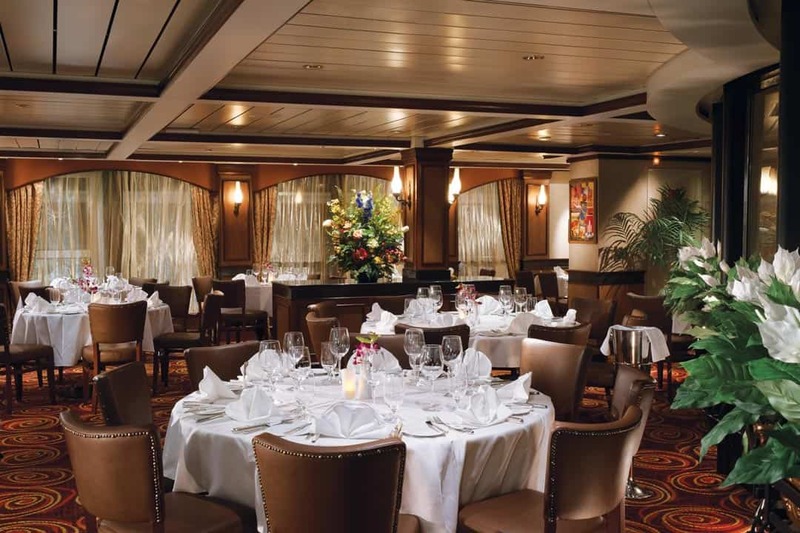 Cruise Venice to Greek Islands whilst enjoying Asian fusion cuisine at Ginza Asian Restaurant. Here they have fresh noodle dishes, wok fried dishes, soups and more. 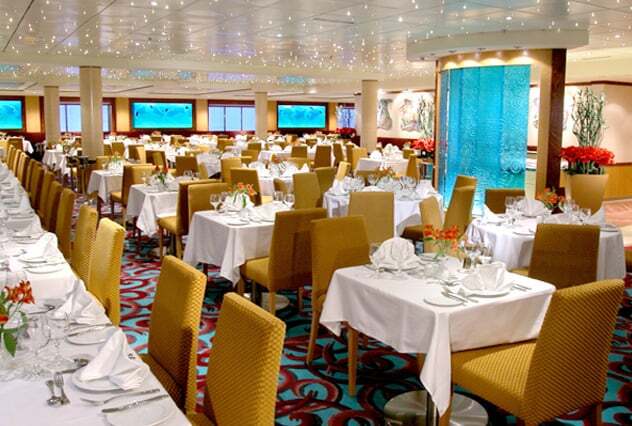 This is one of two main restaurants were passengers eat during the 7 day Greek Isles cruise. The Aqua Main Dining room serves a range of food. 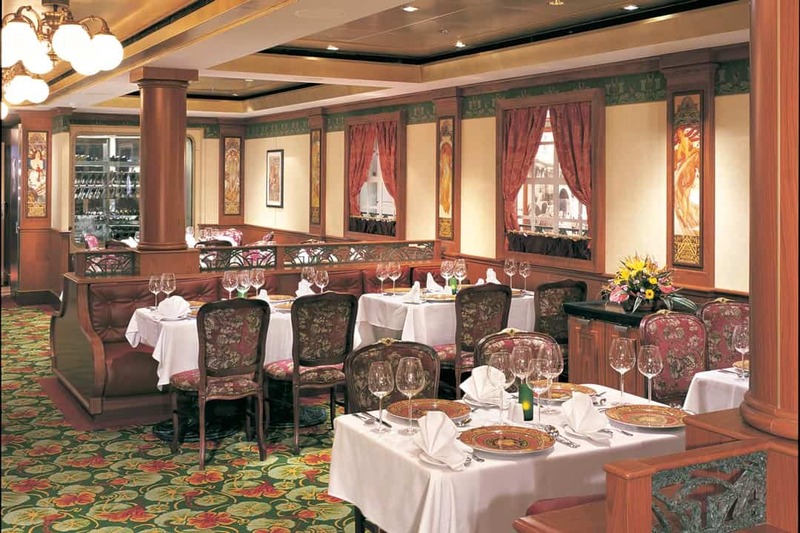 The second main dining room is the Versailles, which also offers a range of dishes. At La Cucina you can enjoy Italian classics like pasta carbonara and lobster fettuccine. Onboard the Norwegian Star there is even a French restaurant too. Le Bistro serves a range of classic French cuisine as well as other Mediterranean dishes. If you need a quick coffee or somewhere to relax, visit the Atrium Café and Bar. Want even more Japanese food? Then head to Teppanyaki where you sit at shared tables and be amazed as the chefs dazzle you with their cooking skills serving up a range of meats. Once the sun goes down, you’ll no doubt want to venture out for a drink or two. 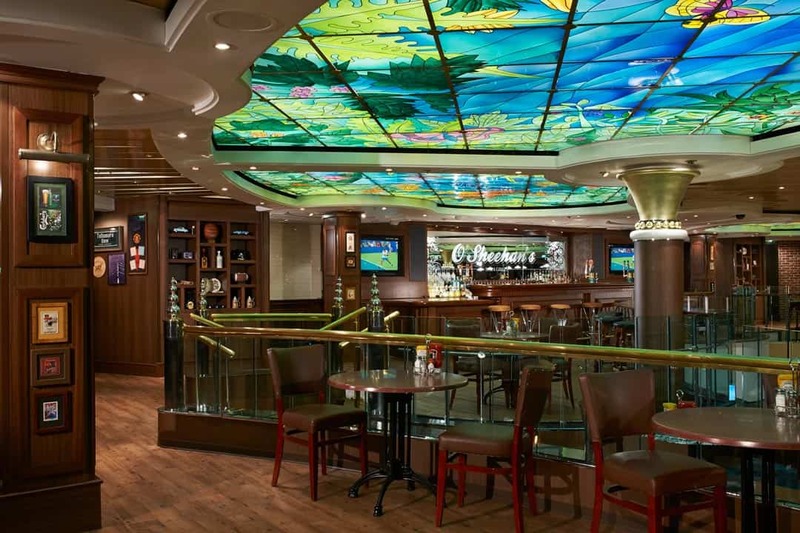 Onboard this cruise there are plenty of great bars to choose from. The Sky High Bar is a casual outdoor bar. As the name suggest this bar serves up mojitos day and night! Adults only at this bar where you can relax in reclined lounge chairs whilst sipping cocktails or join the dance floor in the evening. Ha – I’ve always loved that saying – it’s 5 o’clock somewhere! At this bar, you can chill out whilst drinking a margarita or whatever your drink of choice is. If you want something a little more sophisticated, head to the Gatsby’s Champagne Bar which serves a selection of premium champagne and vodka, caviar, Pate and Foie Gras. If you’re a dancer, then the Bliss Ultra Lounge is where you’ll want to be in the evenings. Great place to dance and have a drink or two. 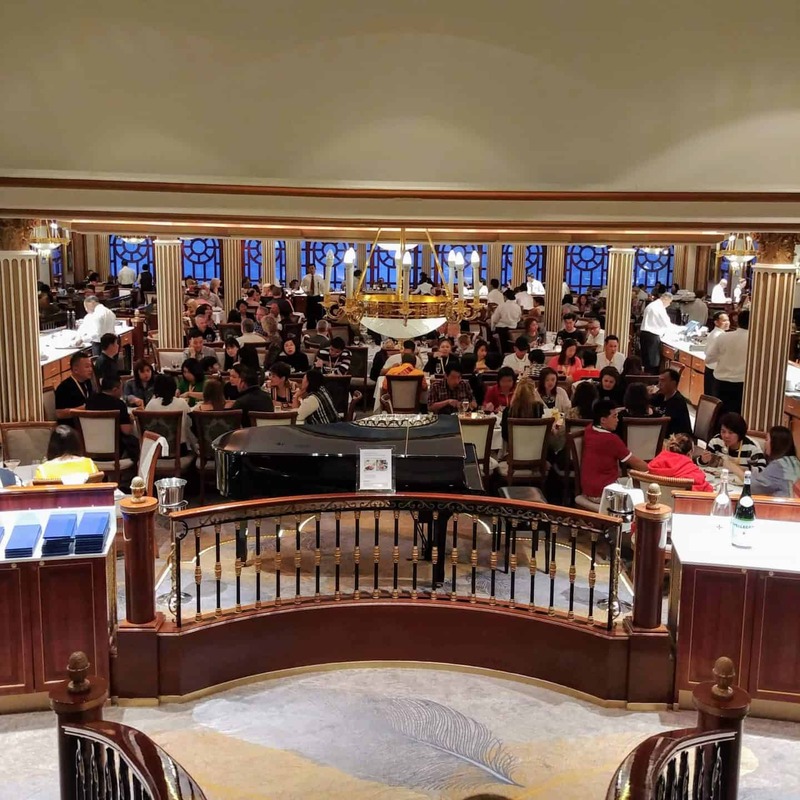 No Greek Island cruises from Venice would be complete with plenty of onboard entertainment, and onboard the Norwegian Star is no exception. There is plenty onboard to keep you busy when you’re not in port. 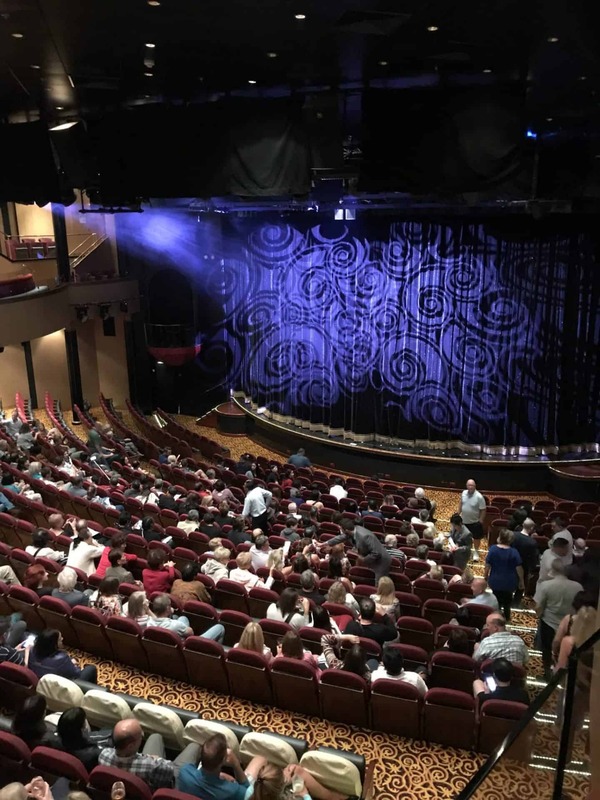 At the Stardust Theatre, you can enjoy fantastic Broadway-style shows in this traditional European opera house style theatre which spreads out over three decks. If you are expecting cheesy all inclusive resort type entertainment, you are going to be pleasantly surprised. The entertainment is amazing – it really did surprise us how fantastic the shows were. If you’re feeling lucky or like a bit of Blackjack, Roulette, poker machine then head on up to the Star Club Casino Bar. 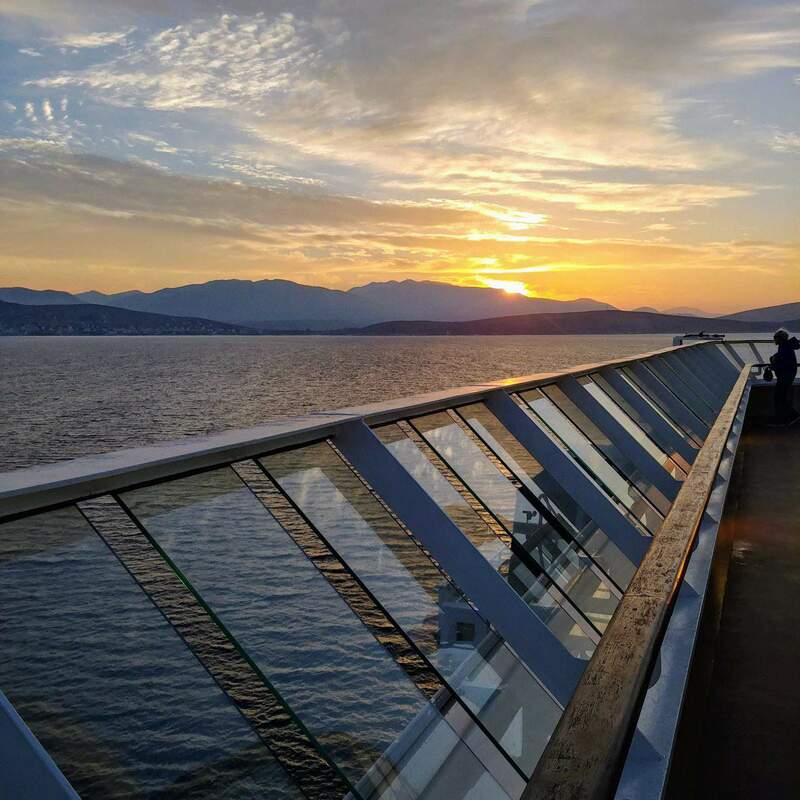 Like all the best Greek Cruise lines, the Norwegian Star has plenty of facilities for you to stay active as well as relax. 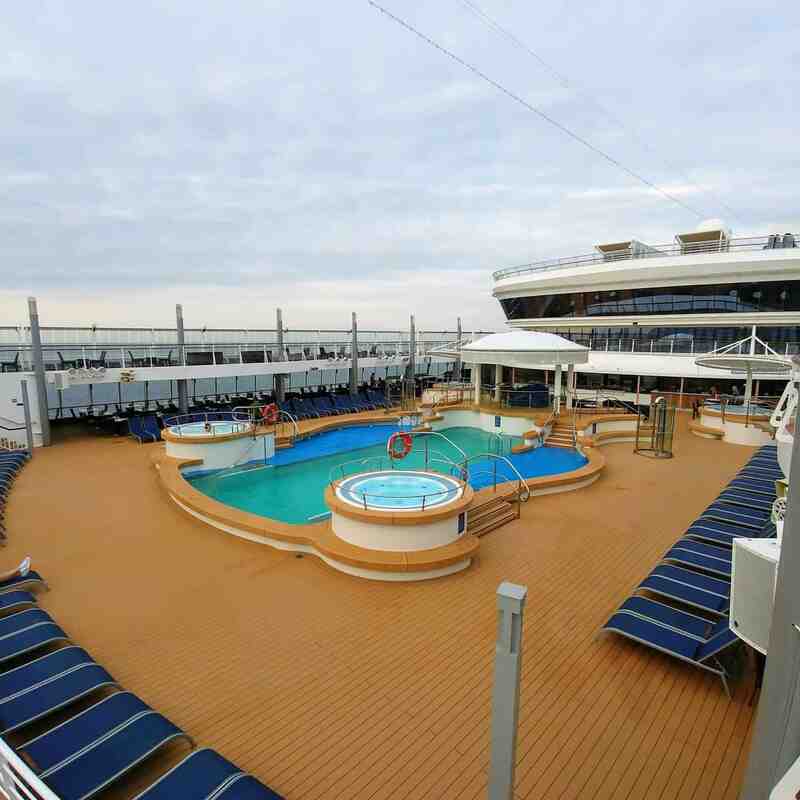 While you cruise Venice to Greece, you can spend time in the Norwegian Star’s main pool which also has two hot tubs. The deck during the sea day was completely full but yet didn’t feel uncomfortable. The ship was full but yet there was enough room for everyone to bask in the sun. There are tiered levels of loungers which allows for more seating with out feeling crowded. Run circles around the other guests or get in your daily walk while you’re at sea. Breakfast always tastes better after a good walk or run, right? We actually found ourselves walking along this track, especially during our day at sea. If being pampered is your idea of a holiday, the Mandara Spa is the place for you. This full-service beauty salon and spa offers a wide range of spa treatments to rejuvenate your body and soul. Shoot hoops, join a game or play volleyball at the enclosed, outdoor Basketball/Volleyball Court. Fore! 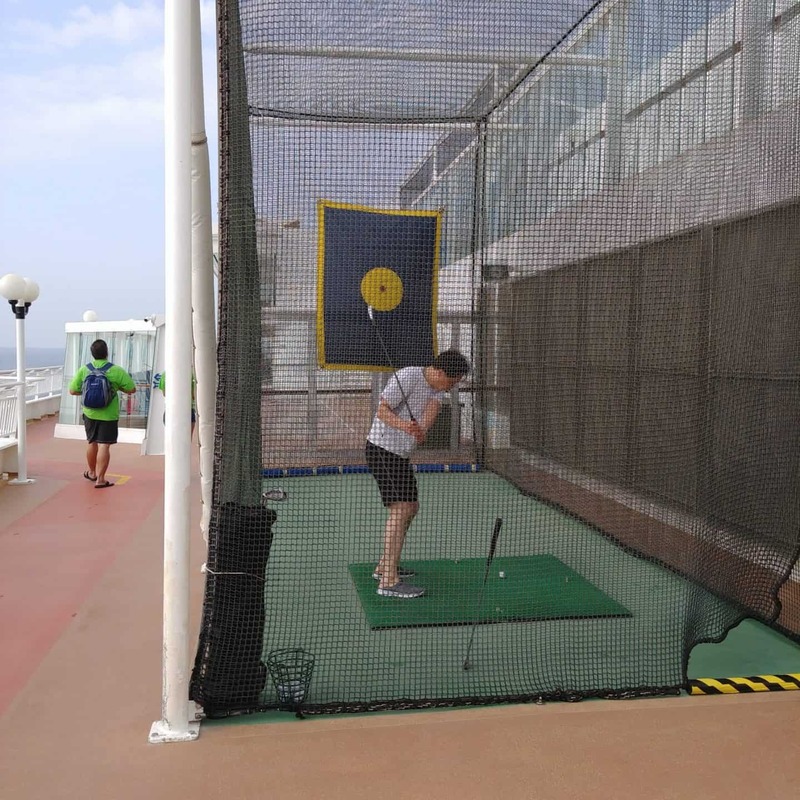 Play a round at one of two Golf Driving Nets onboard, because there’s no such thing as a lost ball or a bad drive on Norwegian Star. 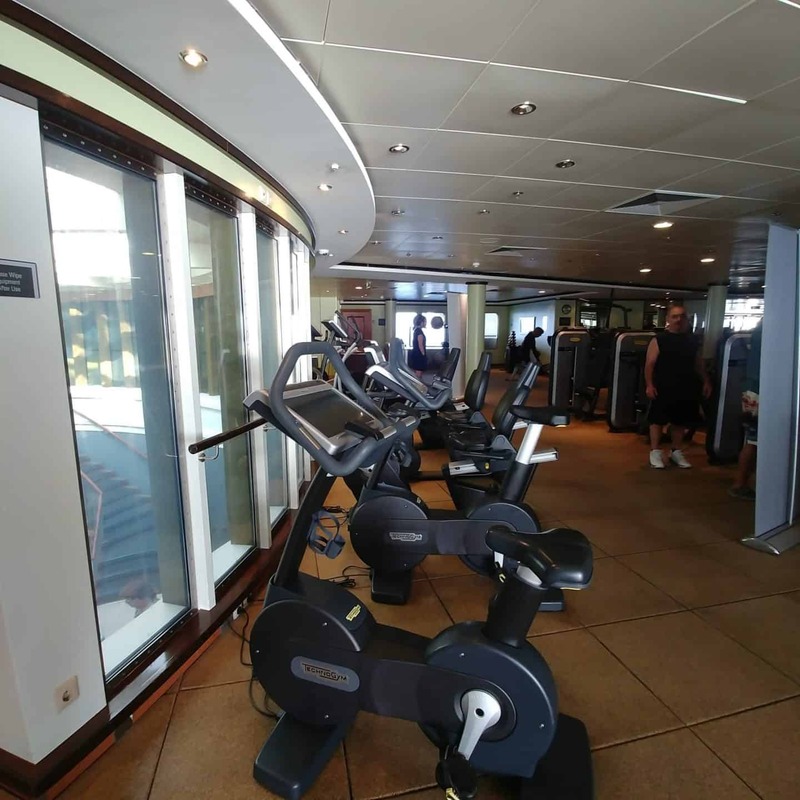 There are numerous ways to stay in shape while onboard. The Barong Fitness Centre is open from 6 am to 11 pm with a full-service gym and aerobics/fitness classes offered daily. No matter how far you are from home, you can stay in touch. The Internet Café can also be used as a computer lecture and training centre. Jump into a splash of fun at Splash Academy just for kids 3-12. Join us for active games, arts, and crafts, and jump into character with the creative theme days. A hip place for teens to hang out. It features a video wall, jukebox, football table, and air hockey. By night the Teen Club turns into a teen disco. Each of our gemstones, whether they be emeralds, diamonds, sapphires or rubies, convey exactly the right sentiment for that special moment. We also carry top brand timepieces at duty-free prices. You’ll find a nice selection of sundries to purchase here. Need a new bathing suit? How about a surprise gift for your sweetheart? The Galleria is a department store that offers a wide selection of brand names and specialty goodies. If you forgot something you can definately find it at one of the cruise shops. Conveniently located in the Atrium, Tides offers the very best deals of the cruise, our exciting one-day specials give you the chance to make savings of up to 70% off US prices what better way to take home a gift for everyone. Make sure you check the Freestyle Daily for day and time of each daily special. The Shopping Galleria on board offers an extensive range of must-have items and Duty-free merchandise, all of which have great savings to US domestic prices. We also offer the best price guarantee, if you are planning to shop this Cruise the best deals are right here on board the beautiful Norwegian Star. The Greek Isle cruises typically start departing in late May or early June and end mid-October. 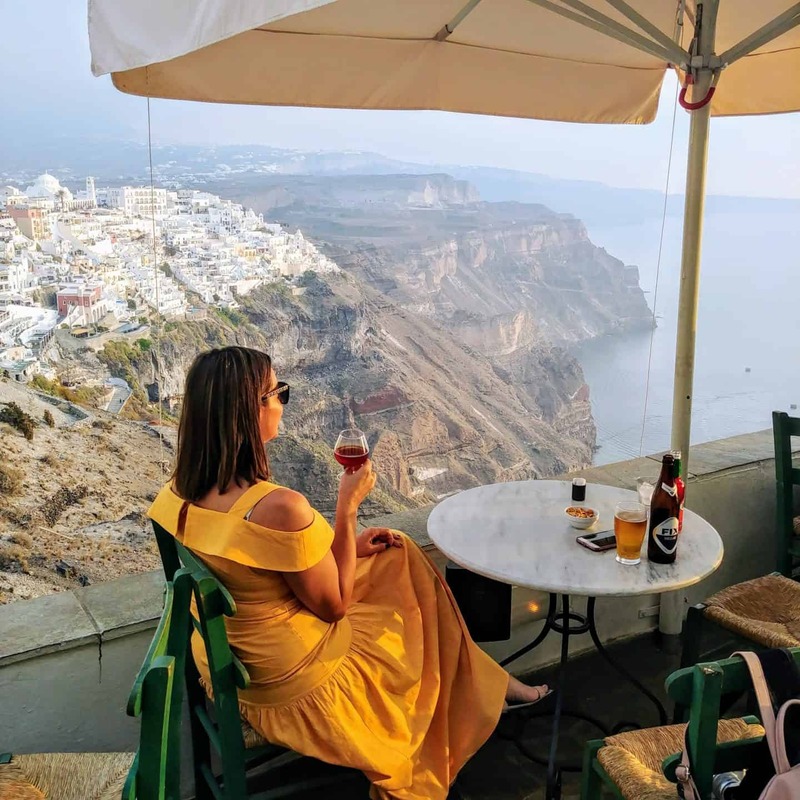 The pricing of a 7 day Greek Isle cruise varies on the room category and the date that you decide to sail and typically starts at approximately $1000 per person for an inside room. The best time to cruise the Greek Islands is anytime really but I would recommend cruising in the early spring or fall. It is fairly hot and crowded in Europe during the summer months. If you cruise at the beginning or end of the cruise season then you can enjoy comfortable weather conditions as well as smaller crowds. This was our second cruise with Norwegian Cruise Lines and we are absolutely hooked. 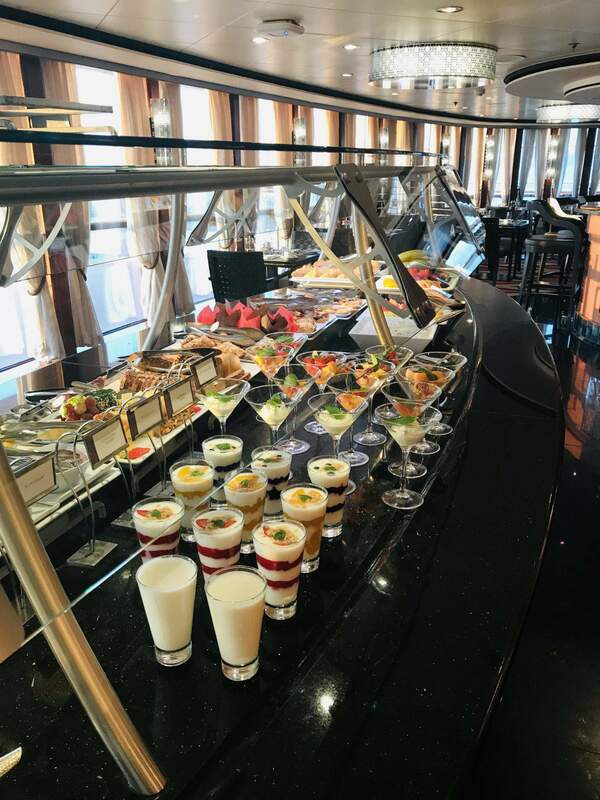 We loved everything from the gourmet food onboard the ship, to the service and of course the destinations. 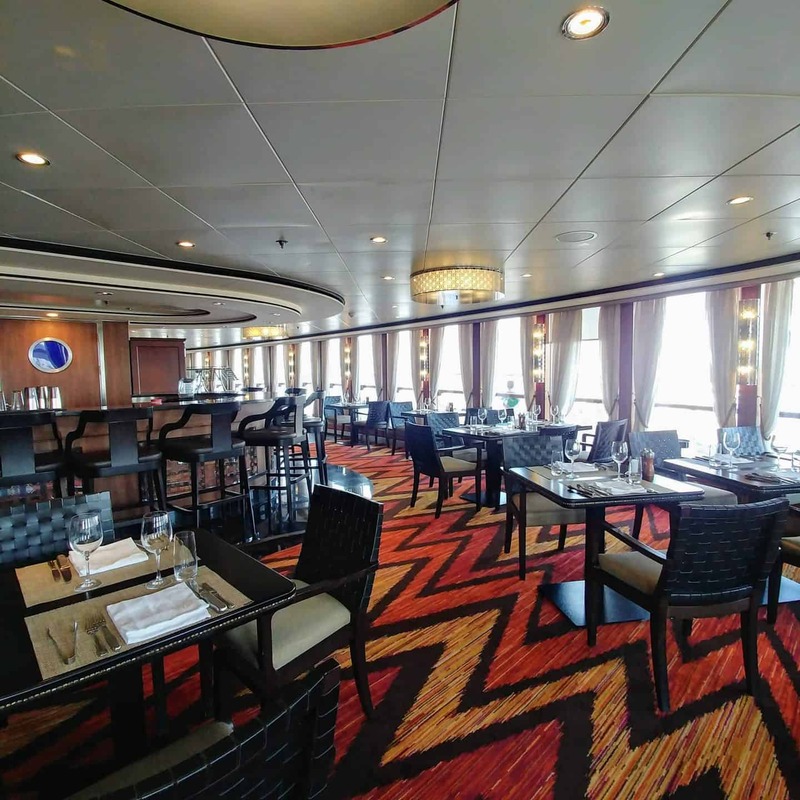 Norwegian offers freestyle cruising that allows you to dine freely when and where you want. 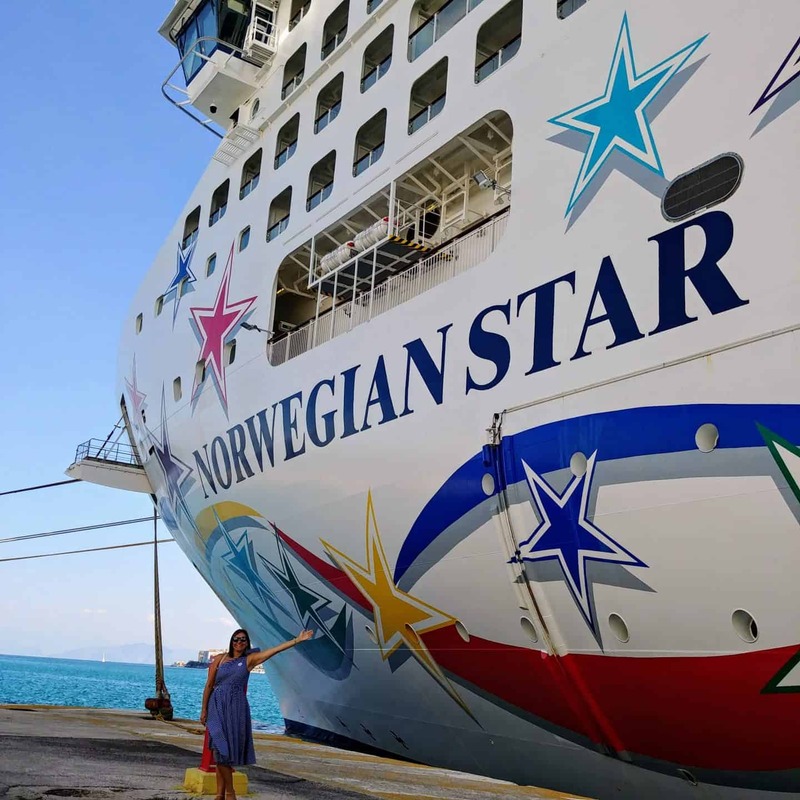 You can do as much or as little as you want on a cruise which is why we think the Norwegian Star is one of the best Greek Islands Cruises to sail on. Thank you to Norwegian Cruise Lines for a fabulous vacation. We loved our time on the Greek Isle Norwegian Star cruise. The service was outstanding and the staff were always there to make sure we had everything we needed to make our vacation memorable. This was a beautiful trip! Going to greece is on my bucket list but i didn’t realize just how many beautiful stops there could be. I am going to look into a cruise for our greek adventure in the future! A cruise seems like the perfect way to explore the Greek islands! Also, your fashion is so on point! This is super interesting to me as someone who’s never been on a cruise. Did you still feel like the experience was really authentic? I think that has always been my biggest barrier! It makes perfect sense, though, that it’s the best way to get around and really see everything. Wow!! It seems like a very busy cruise, but a beautiful one! I like how you got to stop along the way so it wasn’t a long trip to the Greek Islands! That ship looks huge! Such an amazing way to explore the Greek Islands. Your photos have made me consider taking a cruise around the Greek Islands. Wow that’s a jam packed 7 days! Definitely sounds like a lovely experience and the cruise ship looks beautiful! So many food options! Wow you saw so much more than just Greek Islands. Looks like a fabulous cruise to see the Mediterranean coastline especially for folks like me who never seem to have enough holiday time with a full time job. Thanks for sharing! 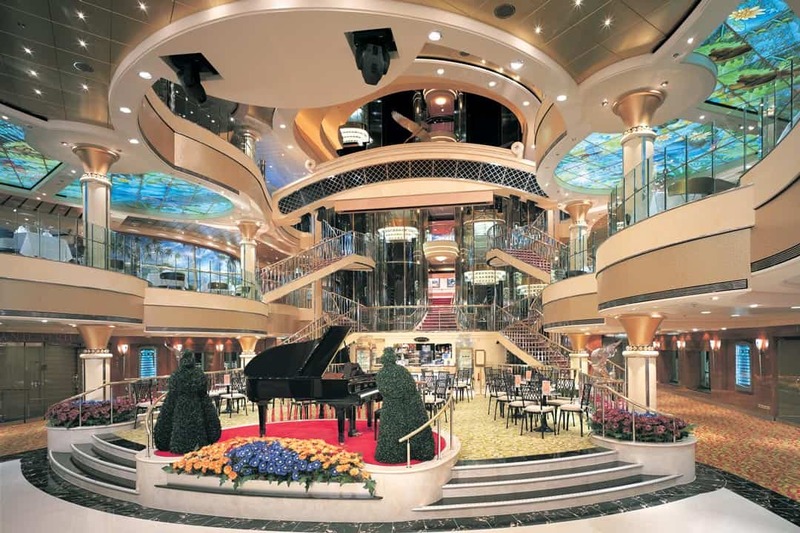 A cruise is the best way to see so many different cities on limited time. We loved it. What a FANTASTIC trip!! Never went on a cruise but would love to in the future. This is such a perfect cruise trip. All the stops are so beautiful and scenic. The cruise ship too looks great and of good vibes. I think it’s time for me to plan this amazing cruise trip. Thanks for the great tips and your pictures are wonderful! 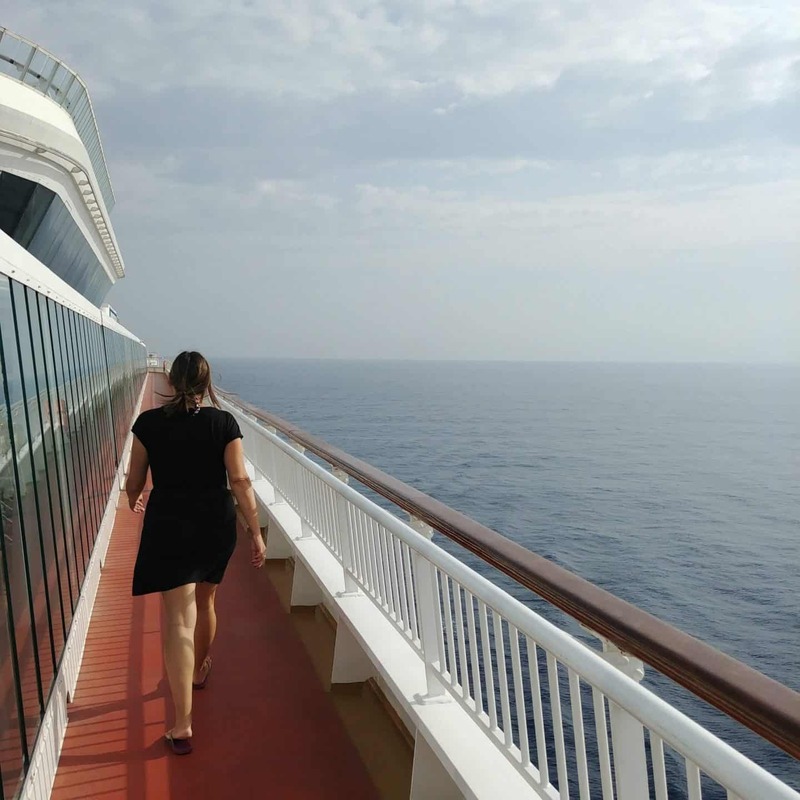 We loved the cruise – such a great way to see so many different destinations. 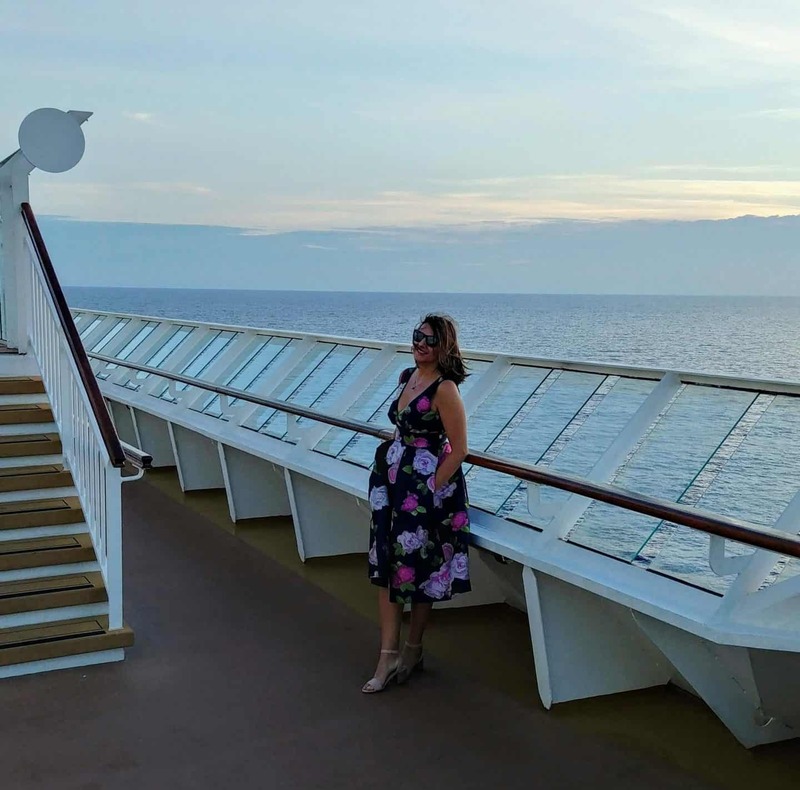 The cruise was amazing – we made so many memories. Fantastic article and pictures, Diana! Very informative. I love NCL too and hope to do this cruise in Sept. or Oct. this year. How exciting – you will love the cruise.